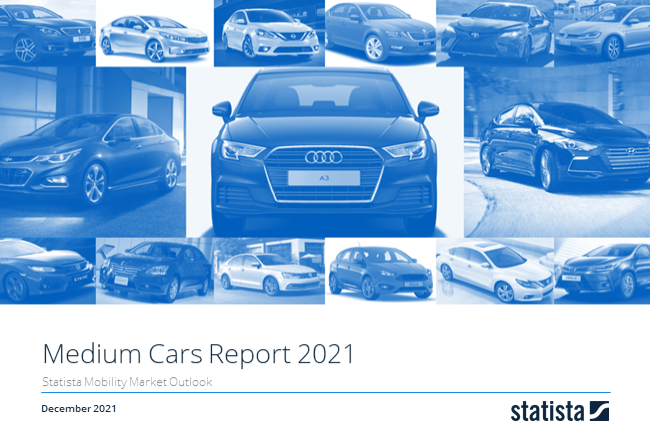 Revenue in the Medium Cars market segment amounts to US$75,004m in 2019. From an international perspective it is shown that most revenue is generated in China (US$124,551m in 2019). The Medium Cars Market segment includes family passenger cars of an average footprint around 4.1m2 (44 ft2), an average mass around 1420kg (3130lbs) and a passenger/cargo volume between 2.8 m3 and 3.1 m3 (100 ft3 and 109 ft3). Medium sized cars existed since 1930’s but they rose in popularity only in 1950’s. In the USA at that time, Ford’s market research unit recognized the large potential of this market and started targeting college educated, higher-income individuals as well as families buying more than one car. In Europe, this market is also known as “Golf Segment”, due to dominance of Volkswagen’s Golf in the last quarter of the twentieth century. Example Models: Alfa Romeo Giulietta, Audi A3, BMW 1 Series, Citroën C4, Fiat Bravo, Fiat Doblo Panorama, Ford Focus, Honda Civic, Kia Cee'd, Lancia Delta, Mazda 3, Nissan Qashqai, Opel Astra, PEUGEOT 308, Renault Megane, Renault Scenic, Seat Altea XL, Seat León, Škoda Octavia, Škoda Roomster, Toyota Auris, Volkswagen Golf. Reading Support Revenue in the Medium Cars market segment amounts to US$75,004m in 2019. The “Revenue” box shows the forecasted revenue development of the selected market (market segment, region). Reading Support In the market for Medium Cars, volume is expected to amount to 3,678.2 t cars by 2022. The “Volume” box shows the apparent consumption of the selected product (market segment, region) in thousands for each year. Reading Support The average price per unit in the market for Medium Cars amounts to US$20,944 in 2019. The "Price per Unit" box shows the volume weighted average price per car in the selected market (market segment, region, make) for each year. Reading Support With a market volume of US$124,551m in 2019, most revenue is generated in China. Here you can find more studies and statistics about "Medium Cars".